The Slepian house bordered on a secluded wooded area, allowing undetected preparation and escape routes for a sniper. Slepian advocated standing up to terrorists of any ilk. He admired Israel’s approach. “Israel doesn’t sit around wringing its hands. They take care of things,” he told a friend. Law enforcement’s pursuit of Kopp started with an observant jogger’s identification of the suspicious getaway car (complete with license plate number — nice work, ma’am) and continued by tracking Kopp’s escape to Mexico with the help of an accomplice and her automobile. Kopp then fled to Ireland and then France using numerous false identities, and cash from his anti-abortion support network. The chase involved dozens of law enforcement professionals from the U.S., Canada, Ireland, Mexico, and France, as well as the cultivation of informants and hundreds of interviews. An intelligent person with scientific training can twist themselves into a fanatical, manipulative, religious martyr. How this happened in Kopp’s case makes for fascinating, but disturbing, reading. Born into a traditional, upper-middle-class, staunch-Republican California family, Kopp played trumpet in his high school orchestra, marched in the band, and blended into the woodwork at school, unlike his more personable twin brother. When he was 20, he lost to leukemia his youngest sister, Mary, a diagnosed schizophrenic and born-again Christian, for whom he had great empathy. His college work in embryology convinced him that abortion killed an innocent human life. “Show me a counterargument based on science, or faith, or something, anything,” he said. In 1983, he graduated with his master’s degree in biology from Cal State Fullerton, with a 3.84 on a 4.0 scale. Irony. Assassins, beware of unintended consequences. 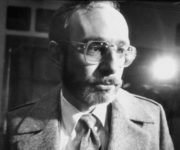 “In Vancouver, Dr. Romalis, allegedly one of Kopp’s victims, continued to practice medicine, but had to alter his practice somewhat. He had always delivered babies as part of his practice. A major part, in fact. But delivering babies, like other surgeries, is a physically demanding job. After he was shot in the thigh, he no longer had the physical stamina to deliver babies — it can involve being on your feet a long time. Romalis couldn’t stand long enough. The wound, the hole punched in his leg by the assault rifle, had put a stop to that. So Dr. Garson Romalis could only do procedures that required little time standing. He could perform what are called, in obstetrics phraseology, terminations. Abortions.” Oops. So, if you enjoy detailed true crime books, want to learn more about a staunch supporter of access to abortion, are intrigued by the psyche of an anti-abortion terrorist, or just enjoy seeing the good guys triumph in the end, consider Sniper: The True Story of Anti-Abortion Killer James Kopp. This entry was posted in Abortion, Book & Film Reviews and tagged abortion, abortion providers, anti-abortion violence, Barnett Slepian, doctors, Dr. Garson Romalis, Dr. Slepian, gynecologists, James Kopp, Jon Wells, Judge Michael D'Amico, justifiable homicide by Anne Hopkins. Bookmark the permalink. The Handmaid's Tale: Dystopian Fiction or a Blueprint for the Future?